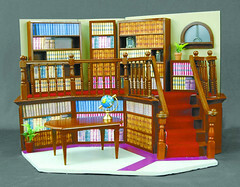 A Giles' library playset! (More info here.) Life is so hard. Willpower is limited. Veronica Mars update: 99.2%. Shortly I will be posting in a panic to ask about codecs because it's not working, I'm sure. Hee! That would be fabulous. Oddly enough, I just saw Tony Head in the 'School Reunion' episode of Dr. Who (got a DVD with that and 'Girl in the Fireplace' in Wednesday's mail). Ooh, it was good, wasn't it? He's so evil. Yes, and he appeared to be having a great time doing it as well. I also got the episode of "Tardis Confidential" that followed it, which was amusing too. Looks good! I'll check it out.